"Housing affordability has become the nation's biggest housing problem, and many veterans find housing unaffordable," says an issue brief from the Housing Assistance Council. It's a rural issue because one-fourth of veterans live in rural areas. Vets make up 13 percent of the homeless population, 11.4 percent of the rural population and 9 percent of the total population. "Providing housing and needed services for our veterans can be complicated in rural areas due to vast geographies, limited resources and less social service infrastructure," the brief reports. As the wars overseas wind down, more veterans will return to the U.S. In the next 10 years, about 70 percent of rural veterans will be 65 or older. Younger veterans are more likely to struggle with costs; about 34 percent of rural veterans in their 20s and 25 percent of veterans in their 30s experience affordability issues compared with 20.3 of veterans 55 and over, the brief says. While 83.3 percent of rural veterans own homes, that is partially due to the overall older ages of rural veterans, and it also reflects a lack of affordable rental housing in rural areas. Unlike the overall affordability issues that mostly pertain to younger veterans, more older veteran renters struggle with affordability issues than their younger counterparts. "An astounding 47.6 percent of veteran renters over age 55 are cost-burdened compared to 37.2 percent of individuals in the 20s and 26.6 of those in their 30s," the brief reports. In Kansas, more than a third of the homeless are veterans, and in West Virginia, one in four is. "Many veterans live with the lingering effects of post-traumatic stress disorder, further complicating their ability to maintain safe, secure housing," the brief says. Horizontal hydraulic fracturing to produce oil and gas is a booming business in the U.S., and is not lacking in controversy, but more than half of Americans don't know anything about the practice, according to a study by researchers at Oregon State University, George Mason University and Yale University. Of the 1,061 people sampled in the "Climate Change in the American Mind" survey, 58 percent "said they didn’t know or were undecided about whether they supported or opposed fracking, while 20 percent were opposed and 22 percent supported it," Bobby Magill reports for Climate Central, a nonprofit news organization that analyzes and reports on climate science. As many consumers gear up for a late-night or early-morning run around town to all the big sales on "Black Friday," signaling the beginning of the holiday rush for presents, don't forget the next day: Small Business Saturday, which promotes shopping at smaller stores. "The day was created in response to small business owners' most pressing need, more customers, and has since grown into an annual celebration of the independent businesses that help boost our local economies," according to a press release from American Express, which founded the event. Many businesses, especially those in rural areas, also use community newspapers to spread the word, buying advertising in their local paper. The share of businesses that say they rely on TV, radio, and newspaper ads doubled from 9 percent last year to 18 percent this year, according to the Small Business Saturday Insights Survey. It also found that 70 percent of businesses say the day will be helpful in attracting new customers. "Some of the biggest players in the flour milling industry are joining forces to make the country’s largest miller even larger," Luke Runyon reports for Harvest Public Media. "The biggest flour miller in the U.S., Horizon Milling, which is jointly owned by privately held Cargill and the agricultural cooperative CHS, proposed earlier this year a merger with the milling arm of food giant ConAgra. The new company would be called Ardent Mills." Utah legislators have a solution for rural residents who don't have regular trash pick-up: bury it. On Wednesday, a legislative committee "endorsed a measure that would clarify that residents of rural Utah who lack garbage pickup service could legally bury their non-hazardous household waste," Amy Joi O'Donoghue reports for the Deseret News in Salt Lake City. The "measure would only apply to rural residents who lack garbage pickup service and only to household waste disposed of on their property." John Egerton, a chronicler of the civil-rights movement, Southern food and culture, and many other topics, died this morning in Nashville of an apparent heart attack. He was 78. UPDATE, Nov. 23: Kim Severson of The New York Times catches up with a well-done obituary. Nov. 24: The Times has an appreciation from John Edge, with whom Egerton founded the Southern Foodways Alliance at the University of Mississippi. "Egerton made his name with Speak Now Against the Day: The Generation Before the Civil Rights Movement in the South, which won the Robert F. Kennedy Book Award," Michael Cass writes for The Tennessean. "He also wrote Southern Food: At Home, On the Road, In History and other books, and he co-edited Nashville: An American Self-Portrait, a turn-of-the-millennium look at the city he moved to in the 1960s." The University of Kentucky graduate was also known for The Americanization of Dixie, and he also won awards for Generations: An American Family. "Mr. Egerton brought a renewed focus to fading culinary traditions and evoked a sense of how food could be a unifying force among people of different backgrounds," writes Matt Schudel of The Washington Post. "Although Mr. Egerton’s books on civil rights and Southern food would seem to have little in common, he considered them deeply intertwined. For him, terror, the fight for justice and slow-cooked meals were all part of the tangled legacy of the world into which he was born." "As a journalist and author John Egerton wrote about social change in the 20th century South with impressive skill and sensitivity. His early reporting in Atlanta on school integration laid the foundation for his great book, Speak Now Against the Day (a quotation from William Faulkner) . . . This was one of those important books that should have won a Pulitzer Prize but didn't. In an exemplary work of oral history, he crafted Generations, about the lives of an Appalachian couple, Burnam and Addie Ledford, married in 1903, who each lived for over 100 years with memories that John transformed into what The Washington Post's reviewer called "a small American epic." . 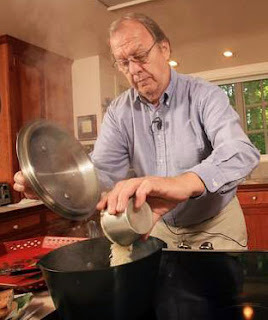 . . John's interest in Southern foodways -- the customs, celebrations, and cooks -- inspired his humanitarian campaign to help New Orleans chefs whose businesses were damaged and lives uprooted by Hurricane Katrina in 2005. He never wrote fiction that I knew about, nor waged crusades in the style of Harry Caudill or Wendell Berry, but for a keen eye, an attentive ear, and eloquent reporting in depth, I don't think he was surpassed by any Kentucky journalist in our time, and few elsewhere in the South." Prospects for a new farm law dimmed today, as the chairman of the House Agriculture Committee "said it would be 'very challenging' now for him to meet the Republican leadership’s schedule of having a final agreement back on the House floor by Dec. 13," David Rogers reports for Politico. Not meeting the deadline "means that the Farm Bill will be kicked over into a third year of debate after Congress failed to act in 2012 and is now at risk of doing the same for 2013," Rogers writes. "Not all is lost: real progress has been made and the process has advanced much further in this Congress. But it raises the prospect that lawmakers will need to adopt a short-term extension into January of at least dairy program provisions." Meanwhile, the White House Rural Council, an interagency group, issued a report listing the benefits of a new Farm Bill, including rural development, conservation, research and deficit reduction. Today's vote by Senate Democrats to eliminate filibusters for presidential appointments, except Supreme Court justices, has important implications for President Obama's plan to regulate greenhouse gases. That's because the regulatory effort will have to pass muster with the U.S. Court of Appeals for the District of Columbia circuit, which "rules on decisions made by federal administrative agencies," Brad Plumer writes for The Washington Post. U.S. consumers are feeling better about the economy, but less so in rural areas, Matt Nager reports for The Wall Street Journal. A real-time measure of how consumers feel about the economy rose from 38.5 in October to 45.7 this month, but the number was only 40.1 in rural areas, the biggest gap between rural areas and cities since February. The number was 47.4 in cities and 45.9 in suburbs. The Economic Sentiment Index, developed by lobbying and consulting firm Hamilton Place Strategies and pollster Civic Science, "measures U.S. adults’ expectations for the economy going forward, as well as their feelings about current conditions for major purchases," according to the ESI website. Much of the talk about a new Farm Bill has centered on the food stamp budget, now $80 billion a year and about 80 percent of the bill's cost. The House has proposed cutting $4 billion a year and changing eligibility and requirements, while the Senate has proposed a $1 billion cut. In addition to food stamp recipients, cuts would hurt rural grocery store owners, Mike Moen reports for NPR. They have already seen the effect of the "food stamp cliff," which saw benefits cut $36 a month for a family of four because an increase in the 2009 economic stimulus package expired. John Anderson, "an economist with the American Farm Bureau Federation, says it's too early to forecast how much of a pinch food retailers might feel in the coming days. But he says there is real concern out there," Moen writes. Anderson told Moen, "In many rural areas around the country, we do have, proportionately, maybe higher participation in the SNAP program. And a lot of that gets spent locally, obviously, because that's where it can be spent, in those local grocery stores." One of the main points of the Senate-passed immigration bill is the idea of a pathway for 11.7 million undocumented workers to gain legal status, and perhaps citizenship, but the bill has stalled in the House. Even the idea of passing legislation to help farm workers and their employers has failed to gain traction. Glendy Martínez, an illegal immigrant from Nicaragua working at a hair salon in Houston, has one child who was born in Texas and three who were born in her native land. She told Preston, “So many people back there depend on those of us who are here. It would be such a help if we could work in peace and go back sometimes to see our children.” While Martínez would like to become an American, what she said she most wants is to be able to work and drive legally and be able to travel from the U.S. to Nicaragua without worry. Yesterday afternoon, Nov 20, Athens County, Ohio, experienced a 3.5-magnitude earthquake, the first recorded quake in the area in 127 years, The Athens News reports. Anti-drilling activists suggested nearby injection wells played a role, but a state geologist refuted those claims. Some have blamed oil and gas production sites for a recent rash of earthquakes around Oklahoma City. Less than 24 hours before the earthquake was detected, 160 people attended a meeting with Athens County commissioners, with most in attendance protesting a proposed injection well for oil and gas waste that would be the state's largest such well, Bob Downing reports for the Akron Beacon Journal. "By the end of this year, an industry-mandated conversion to digital projectors will make it nearly impossible for many small, one or two-screen theaters in isolated towns across America to continue to operate," Stephanie Garlock reports for The Atlantic Cities. Digital-only benefits movie studios, because "the picture is generally clearer, and, more significantly, the financial and logistical costs of distribution are radically lower. A single copy of a 35mm feature film costs studios upwards of $1,500, while copies on digital hard drives run at about a tenth of that, with prices falling fast. Eventually, satellite transmission could make getting first-run films to theaters across the globe virtually hassle-free." Colorado has a plan to save its rural theaters. State grants have awarded $200,000 to help save 13 rural theaters -- many of which only have one screen -- and officials hope a fundraising campaign will give the owners enough to pay for the rest of the conversions, Bente Birkeland reports for public radio station KUNC. Traffic fatalities in rural areas rose 2.3 percent from 2011 to 2012, from 17,769 to 18,170, according to the U.S. Department of Transportation. Nationwide, deadly accidents increased at a faster rate, 3.3 percent, the first rise in six years. However, most of the big state-by-state increases in deadly accidents were in states with large rural populations. Fatalities in Vermont rose 40 percent, from 55 to 77. The next highest increase, 26 percent, was in Hawaii. In Maine, the state with the largest percentage of rural population, fatalities rose 21 percent, from 136 to 164. South Dakota and New Hampshire had increases of 20 percent, Nebraska 17 percent, North Dakota 15 percent, Delaware 15 percent and Idaho and Ohio 10 percent. 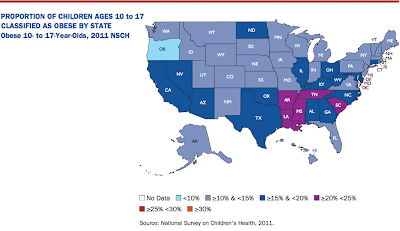 Some states with large rural populations, however, saw big drops. Fatalities in Alaska dropped by 18 percent, from 72 to 59. In Utah the number fell 11 percent, and in Wyoming it dropped 9 percent. Mississippi, which had the biggest change of any state with 48 fewer deaths, saw its fatalities drop 7.6 percent, from 630 to 582. The biggest increase in road deaths was in Texas, where the number rose 11 percent. Deaths on federal highways, which are mostly in rural areas, rose 5.6 percent in 2012, with motorcycle deaths rising 9 percent. More than half of fatal accidents involved motorcycles or pedestrians. Alcohol-related deaths rose 4.6 percent. Through the first six months of 2013, there were 15,470 fatalities on U.S. roads, down 4.2 percent from 16,150 from the year before. That is probably a good indicator for the whole year; 72 percent of fatalities in 2012 occurred during the first three months. State numbers for 2011 and 2012 are available by clicking here. Numbers for the first half of 2013 are available here. Accepting the project "would mean joining forces with TransCanada Corp. and the North Slope's three major energy producers -- BP Alaska, ConocoPhillips Alaska and Exxon Mobil Corp.," Hobson writes. "Those companies have done preliminary planning work on an 800-mile pipeline that would run from a gas treatment facility in Prudhoe Bay to an export facility in south-central Alaska. Last month, the companies announced that if they build the long-awaited pipeline, they're likely to site a gas liquefaction plant and export terminal at the Kenai Peninsula town of Nikiski. But after years of debate and discussion, they have yet to commit to actually building the project." Will the coal industry run short of capital because too many investors are concerned with the greenhouse gases that mining and burning it will generate? Jesse Riseborough and Thomas Biesheuvel of Bloomberg News explore the possibility, suggested by a Norway investment fund's sale of coal and oil-sands stocks and a proposal by the country's opposition party to keep its sovereign wealth fund, the world's largest, from investing in coal. The National Association of Farm Broadcasting elected Janet Adkison, right, of RFD-TV/Rural TV, Nashville, president at its meeting last week in Kansas City. Susan Littlefield, farm broadcaster at KZEN-FM, Columbus, Neb., was chosen as president-elect, and Brian Winnekins of WRDN-AM, Durand, Wis., was elected vice-president, Agri-Pulse reports. The NAFB website lists winners of awards handed out at the meeting. Did you ever wonder what percentage of people in your county or state speak a language other than English when they're at home? How many students in your state are studying abroad? How many foreign born people live in your state? How many people work for import or export companies? These, and other answers about language, education, and economics are available at the click of a button on a website called Mapping the Nation. The interactive map is easy to use. By clicking on a state, users can see county-by-county data. For example, the map above shows the number of postsecondary students studying Spanish in Pennsylvania. 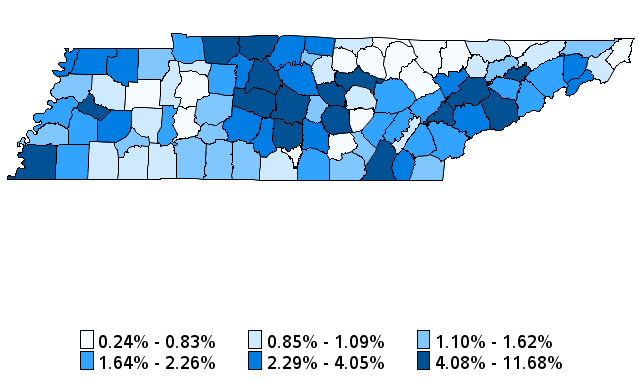 Below a map showing percentage categories of people who speak languages other than English in Kentucky. Similar maps are available for specific languages. The Medicare quality incentive program, strengthened under federal health reform, has benefited 1,231 hospitals (45.1 percent of U.S. hospitals), and hurt 1,451 (53.2 percent) by paying them more or less for each Medicare patient they treat, based on a new set of quality measurements, Jordan Rau reports for Kaiser Health News. For data on any hospital, click here. Penalties and bonuses vary widely, with Arkansas Heart Hospital in Little Rock, "a physician-owned hospital that only handles cardiovascular cases," getting the largest bonus at 0.88 percent, while "Gallup Indian Medical Center in New Mexico, a federal government hospital on the border of the Navajo Reservation, will be paid 1.14 percent less for each patient," Rau writes. Only one other hospital lost more than 1 percent of its reimbursements. Kaiser's analysis found that 60 percent of hospitals in Maine, Massachusetts, Nebraska, New Hampshire, North Carolina, Utah and Wisconsin are getting higher payments, but payments have been reduced in at least 60 percent of hospitals in Alaska, Arizona, Arkansas, California, Connecticut, Delaware, Hawaii, Idaho, Mississippi, Nevada, New Mexico (86%), New York and North Dakota (83%), and Oklahoma, Oregon, Tennessee, Vermont, Washington, West Virginia, and Wyoming (88%). Medicare reduced its payments to all hospitals by 1.25 percent during the second year of the program, putting $1.1 billion into an incentive program, Rau writes. But not every hospital is getting the 1.25 percent back, and some are getting more back. That's because Medicare is judging hospitals based on how they compare against each other, and how much they've improved in the past two years compared to other hospitals, with hospitals judged by the higher score, which benefits hospitals that made significant improvements, even if those hospitals have lower overall quality rankings. Forty-five percent of a hospital's score "is based on how frequently it followed basic clinical standards of care, such as removing urinary catheters from surgery patients within two days to decrease the chance of infections," Rau writes. "Thirty percent of the score is based on how patients rate the way they felt they were treated in the hospital, such as whether the doctors and nurses communicated well." The remaining 25 percent is based on mortality rates "calculated from the number of Medicare patients who died in the hospital or within a month of discharge." Because Republican Gov. Nathan Deal and the GOP-controlled legislature did not expand the Medicaid program under the federal health-reform law, Georgia hospitals will not get "about $400 million in federal subsidies to pay for care for indigent patients over the next four years," Reinhardt writes. In 2017, the state would have to pay 3 percent of the expansion cost, topping out at 10 percent in 2020. Americans in rural areas, especially the South, are not receiving much-needed training in cardiopulmonary resuscitation, according to a study at Duke University that is reported in the Nov. 18 edition of JAMA Internal Medicine. "Each year, more than 350,000 Americans experience cardiac arrest outside of a hospital. On average, 7 to 9 percent of people survive, but these figures vary by geographic location," a Duke news release says. "Research has shown that when bystanders perform CPR, it doubles the likelihood of an individual surviving cardiac arrest outside of the hospital. However, rates of bystanders performing CPR vary widely, from 10 percent to 65 percent, depending on the community." Researchers concluded, "These data, coupled with previous work demonstrating lower rates of bystander CPR among communities with higher proportions of minority populations and lower socioeconomic status, suggest that variation in bystander delivery of CPR may indeed be related to variation in rates of CPR training within communities. The work also highlights striking disparities in CPR education based on racial, socioeconomic, and geographic factors." The Kaiser Family Foundation's series of informative webinars for journalists covering the Patient Protection and Affordable Care Act continues Thursday from 12:30 to 1:30 p.m. ET. The fifth installment of the webinar will concentrate on how the act affects baby boomers and Medicare beneficiaries. Kaiser senior fellow Karen Pollitz "will focus on the ACA’s role for baby boomers who are not yet 65, and eligible for Medicare, and their access to new coverage options in marketplaces and/or their eligibility for premium subsidies or Medicaid expansions." Dr. Juliette Cubanski, an associate director of the Program on Medicare Policy at Kaiser, "will talk about how the ACA impacts Medicare benefits and beneficiaries." Most of the hour will be questions and answers. Journalists who want to register can RSVP by clicking here. Shortly after registering, each participant will receive a confirmation email that contains information about how to join the webinar. If you are unable to join this webinar but would like to receive all future updates about the series, you can email your name and media affiliation to acawebinars@kff.org. Video and transcripts are also available for the other webinars: “What Do Consumers Need to Know About Health Reform’s Changes,” “Understanding Insurance Premiums Under the Affordable Care Act," "The Impact of State Decisions," and Researching Consumer Stories, Finding New Ideas & Securing Real World Examples. UPDATE: For a comprehensive look at the standards debate, click here. For a look at the experience in Kentucky, the national leader in adopting the standards and tests, go here. Some children are not in school today because their parents are keeping them home in protest of the Common Core education standards that 45 states have adopted. It's the third such annual protest, reports Chalonda Roberts of WHEC-TV in Rochester, N.Y., but seems to be getting more attention as school systems begin to implement the standards. Charley Hannagan of The Post-Standard in Syracuse writes about a strong reaction to her story about a local family joining the protest. The organizers of “Don’t Send Your Child To School Day” issued a press release saying, “We recommend that you keep your children out of school . . . and help us send a message to the federal government. We the people want evidence-based curriculum that is locally controlled and which does not require data mining our children.” As Chuck Todd and his NBC News "First Read" colleagues note, "Common Core is not a federal government initiative, but one that was created by governors. Yet that hasn’t stopped this scare campaign among some on the right. To us, it’s amazing how Common Core standards have become a hot political potato. In many respects, it’s the Tea Party meets education reform." Long before the Patient Protection Affordable Care Act went into effect, local and state government agencies began cutting part-time employees to avoid having to give them health coverage. Concern, and debate, has now turned to health reform's impact on part-time school and college employees. Republicans at a Capitol Hill hearing last week "predicted that school systems would be forced to cut programs to account for the law's pricetag, and possibly scale back employees' hours," Sean Cavanagh reports for Education Week. The act "mandates that public and private employers with at least 50 workers provide health insurance to full-time workers—defined as employees working an average of 30 or more hours a week—or face fines. That requirement would apply to many school districts," Cavanagh writes. "Some school systems that rely heavily on hourly workers to fill positions such as instructional aides, support staff, and other roles say the provision will force them to reduce those employees' work weeks to get below the 30-hour threshold. Others say it could lead districts to offer their employees watered-down health plans." The AAR recommendations may not sit well with those to make and lease tank cars, because they "are expected to bear the initial costs from any tougher standards," Sobczak writes. "By contrast, freight railways rarely own the cars moving on their tracks, so they wouldn't have to devote much capital to upgrading tank cars Ultimately, shippers will absorb the expenses brought by new regulations, potentially affecting railways' competitiveness in the oil sector." 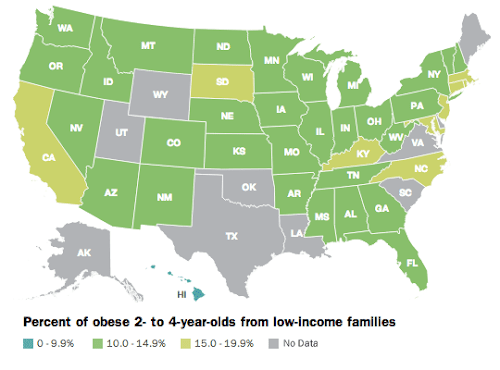 How fat are your state's children? Each state's percentage and ranking appears in a report from the Trust for America's Health and the Robert Wood Johnson Foundation. Federal and state officials are fighting child obesity with improved school nutritional guidelines, and efforts are also being made to increase the standard expectations of physical activity, increase the activity requirements in child care facilities, according to the federal Centers for Disease Control and Prevention website. The frequency at which children eat fast food, and its nutritional value, are also challenges in decreasing childhood obesity. Kids and teens consume up to 300 calories more per trip to a fast-food or full service restaurant compared to days they eat at home, Ryan Jaslow reports for CBS News. Although fast-food restaurants have made some improvements with healthier sides and beverage choices in most children's meals, "there is room for improvement," researchers say in the "Fast Food Facts 2013" report, issued by Yale University's Rudd Center for Food Policy & Obesity. The report examines how 18 major restaurant chains market their foods and beverages to children and teens, and analyzes the nutritional quality of the chains' food. Significant findings included: Less than 1 percent of all children's meal combinations at such restaurants met recommended nutrition standards; McDonald's spent 2.7 times as much to advertise its products as all fruit, vegetable, bottled water and milk advertisers combined; the total amount spent on all advertising by fast-food restaurants in 2012 was $4.6 billion; preschoolers viewed 2.8 fast-food ads per day in 2012; children 6 to 11 saw 3.2 such ads per day; and teens viewed 4.8. 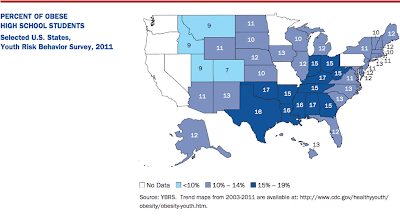 The researchers also found that fast-food restaurants continued to target black and Hispanic youth, populations at high risk for obesity and related diseases. Researchers called for fast-food restaurants to stop marketing unhealthy foods to children and teens, saying "Research shows that exposure to food marketing messages increases children’s obesity risk." 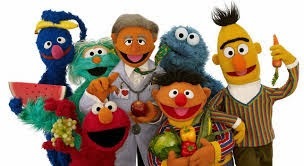 (Read more) On the marketing front, "Sesame Street" characters have joined the Produce Marketing Association to help market fresh fruits and vegetables to children, according to a press release from the Robert Wood Johnson Foundation. "Marketing healthy products with the same skill and vigor typically used for less healthy options could make a major difference in shaping children's food preferences," Dr. Risa Lavizzo-Mourey, the foundation's president and CEO. "I have a vision of children pestering their parents for pears and begging for broccoli." Landowners, oil-industry group sue to block first countywide ban on oil drilling in U.S.
Mora County, New Mexico, is a small county making big waves. In April, commissioners in the county of 4,500 voted to ban all oil drilling, including hydraulic fracturing and the use of water for fracking. Now, the county is facing a lawsuit from an oil-industry group and landowners who want to lease drilling rights, Steve Terrell writes for The New Mexican in Santa Fe. The ordinances say "corporations violating the local law won't have the rights of 'persons' under the U.S. and New Mexico constitutions and cites local residents' water rights under the treaty of Guadalupe Hidalgo, which ended the U.S.-Mexican War in 1848 and made New Mexico a U.S. territory," Mike Lee reports for Energy Wire. "Natural communities and ecosystems including, but not limited to, wetlands, streams, rivers, aquifers and other water systems, possess inalienable and fundamental rights to exist and flourish within Mora County against oil and gas extraction. Residents of the county, along with the Mora County Commission, shall possess legal standing to enforce those rights." The Environmental Protection Agency approved changes to the way Kentucky will measure selenium in its water, a controversial move the coal industry and the state favor, but that environmentalists have criticized, Erica Peterson reports for WFPL Radio in Louisville. Under current regulations, "Kentucky’s water quality standard for selenium is based on the amount of the substance that’s in the water." Under the new regulations, "If water testing reveals levels that are above a certain benchmark, that will trigger fish-tissue testing." Critics say catching fish to sample will be difficult. The EPA said: “In the event that sufficient fish tissue cannot be obtained, the permit holder will be deemed to be in non-compliance . . . for exceeding the chronic trigger level of 5.0 µg/L.” Selenium, "a naturally-occurring substance that's released into waterways during strip mining," is "toxic to both aquatic life and humans, Peterson writes. "The substance also bio-accumulates up the food chain, so as fish eat other fish, levels of selenium rise." (Read more) To read the letter the EPA sent announcing its decision, click here. More more background, go here. Farmers and ranchers in South Texas are using smartphones to put an end to the damage caused by the region's feral hog problem, David Sears reports for KSAT-TV in San Antonio. The use of modern technology to stop the area's estimated 5,000 to 6,000 wild hogs has caught on quick, with rancher Brian Heideman saying he caught 29 hogs the first night he used the new technology. The technology is simple: a 25-foot wide remote-controlled gate on a round pen that can be operated by cell phone, Sears writes. "The gate has a motion detector on it. When it senses something, it sends a text or email to Heideman’s cell phone, along with an attached picture. If he sees he has some hogs in the trap, he hits and button and the gate closes, allowing him to catch the critters from anywhere."